The “lifetime free incoming” calls facility is all set to kill in coming months. The benefit of free Incoming Call on your SIM is soon going to be ended as Indian telecom operators have recently made major changes to their tariff plans. Reliance Jio had brought the concept of free unlimited voice calls and introduced that users will be charged only for data. Introducing charges for non usage or forced usage may hit many people who depend on this facility. There are many users especially in rural areas who have mobile phones dedicated for incoming calls only. These users rarely perform any recharges. Even if they do, they recharge their SIM with minimum amount. This has resulted in the low ARPU for the telecoms. Average Revenue Per User (ARPU) has led to the merger of Idea and Vodafone. The revenue crisis in telecom sector is so severe. Now, telecom firms have decided to actually charge the users for incoming calls. Yes, it is shocking, but that is exactly what they are doing now. 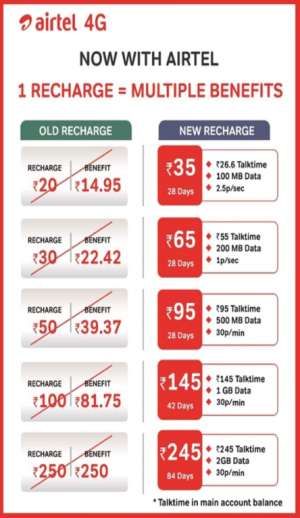 Major telecom players like AirTel, Idea-Vodafone etc have already started to come up with the minimum recharge plans. These plans come with validity of 28 days and the minimum recharge may be of Rs 35. 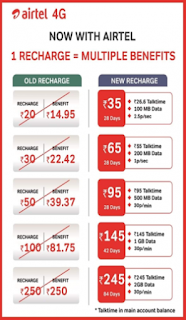 Airtel has already listed out three such recharge plans - Rs 35, Rs 65 and Rs 95. The Rs 35 plan comes with benefits like talk time of Rs 26 and 100MB data with 28 days validity. This will renew the user's incoming call facility. What would be the reaction of subscribers against this new step by telcom's will be interesting ?